This is an original document from the New Games Movement, but (like its sequel, More New Games) might be a bit difficult to find these days – second hand bookshops are helpful here. 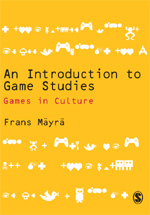 New Games were forms of play that aimed to make a positive impact on culture and society. Fluegelman, Andrew (ed) (1976) New Games Book. New Games Foundation. New York: Dolphin/Doubleday. As games have expanded into virtual worlds with hundreds, thousands and now even millions of people interacting within their realms, the social and psychological issues of online interaction have gained increased importance. Julian Dibbell’s article tells an illustrative story of an event taking place in an early text-based MUD, but it provides much food for thought . DeKoven, Bernie (2002) The Well Played Game: A Playful Path to Wholeness (3rd edn). San Jose (CA): Writers Club Press. Online site: http://www.deepfun.com/WPG.htm.